Crisafulli electric powered Rotomite-6000 CE (R6CE) dredge, designed for customer convenience, safety, and productivity, engineered for a full range of dredging applications from soft to highly abrasive slurries, powered by an external electrical source at the customer’s electrical utility facility. The all-purpose Rotomite-6000 CE dredge offers forward mounted heated & air-conditioned operator’s cab with 360-degree visibility, and the safety guardrail surrounding the dredge. While many features of the Rotomite-6000 CE are similar or identical to the Rotomite-6000, the Rotomite-6000 CE has several new and unique features that increase productivity and versatility. Every component that processes slurry on the Rotomite-6000 CE was selected for abrasion resistance. 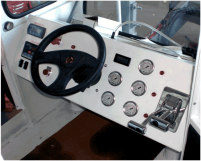 An inside view of the Operator’s Cab on the Rotomite-6000 CE. All dredge functions are controlled from the Cab. The Cab is heated and air-conditioned for the Operator’s comfort, safety, and to enhance dredge productivity. For abrasive and soft slurries. Engineered as a modification to SRS Crisafulli’s established and proven successful Rotomite-6000, the new Rotomite-6000 CE is designed to dredge efficiently the full range of applications from soft slurries to highly abrasive slurries such as sand. Electric Powered Dredge. SRS Crisafulli designed the Rotomite-6000 CE for an electric power plant. The economics of using available, low cost electricity, rather than a diesel engine, motivated the customer to specify the use of electric motors to power the dredge and the hydraulic system. Cast alloy pump. We replaced the fabricated pump used in the Rotomite-6000 with a cast alloy pump by Georgia Iron Works, the GIW Model LCC-M 150-500, designed specifically for abrasive applications. All dredge systems have been “hardened” to handle abrasive slurries including a new cutterhead. Great visibility. The Operator has clear view of dredging operations from the forward positioned cab with large windows on all four sides on the Rotomite-6000 CE. The new cab (with optional air and heat) is accessible from either side of the dredge for improved convenience, productivity, and safety.